The best thing about slice and bake cookies is you can color them to any theme Holiday you want! These are lemon flavored butter cookie tinted with orange, yellow and left the third section white. I dont think you'll find a more buttery tasting cookie than these. Almost like shortbread but better and perfect for the Holiday. A versatile cookie for whatever event or Holiday theme you have in mind, make the color to match or leave them plain, as as simple elegance. Simple dough. They can be frosted, dusted with powdered sugar or cinnamon sugar. They freeze well and perfect for any holiday! Mix the flour, salt and baking powder together in a measuring cup or bowl set aside. In a heavy duty electric mixer beat the butter and sugar till light around 4 minutes. Add the egg and vanilla, blend evenly. Pour in the flour mixture and beat on low speed until dough comes together. Turn the dough onto some wax paper and shape into a 12x2inch long. Wrap in wax paper or plastic wrap and freeze for 2 hours. Keep turning every half hour not to lose it's shape. 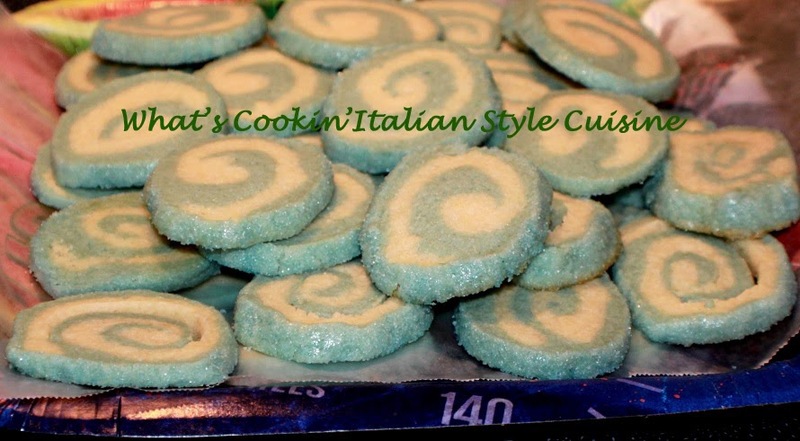 Slice rounds to 1/4 inch thick or 1/2 inch thick for a softer cookie and bake and place on a parchment lined cookie sheet at 350 degree preheated oven. Bake anywhere from 4 to 8 minutes depending on the thickness and if you want crisp cookies or soft. You can either make a few and then return the dough to the freezer or bake them all and freeze the cookies and take out as needed. Tint the dough by separating the dough into three sections before freezing it. Tint each part to whatever color and flavoring you would like by Holiday or event as you like. I left one of them white. You can make green and red for Christmas, pink and blue for a baby shower, red, white and blue for a Patriotic Theme or even Easter with pastels of your choice. The list is endless! Or just try some of the flavors below leaving plain not colored. The flavoring in these are lemon. Roll each piece out on a board measuring to the same size. Place on a sheet of wax paper. Stack one on top of the other roll up like a jelly roll making sure all the middle colors are covered and the ends are tucked in. After you roll this up freeze the dough in a tube to hold the shape (I used a paper towel holder, cut up the middle) freeze for 2 hours, turning over every half hour or so. Proceed to slice with a sharp knife, place on parchment paper or silpat mat and bake as directed above. See below for making slice and bake cookies with different flavorings. Coffee: add 1 tablespoon in with the egg. 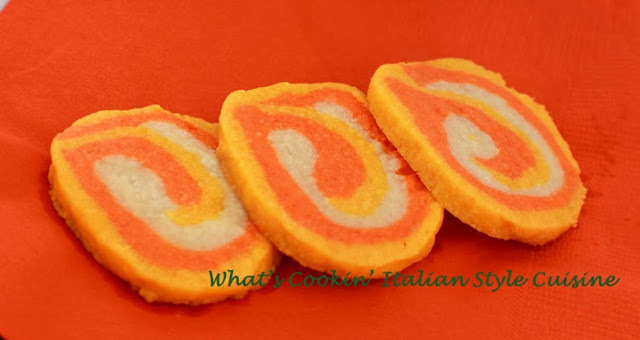 I've always wanted to try these colorful cookies! I've done this for Christmas, but need to try your fun Halloween version!